A deadly strike at a UN-run school in Jebalya refugee camp in northern Gaza that killed 16 people and wounded scores more has been condemned by the United Nations Relief and Works Agency. "I condemn in the strongest possible terms this serious violation of international law by Israeli forces," said UNRWA commissioner General Pierre Krahenbuhl. "This is the sixth time that one of our schools has been struck," he said. The Israeli military, in an initial response, said militants near the UN facility had fired mortar bombs and Israeli forces had shot back. Mr Krahenbuhl said about 3,300 people had been sheltering in the school at the moment it was struck. 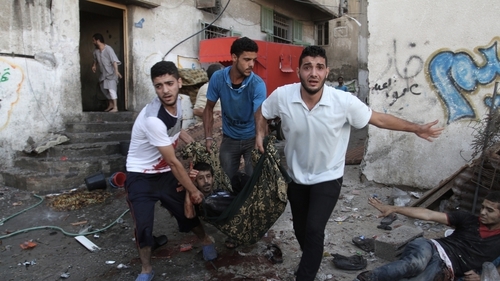 More than 100 people died in Israeli strikes across Gaza today, medics said, including 17 at a crowded marketplace. 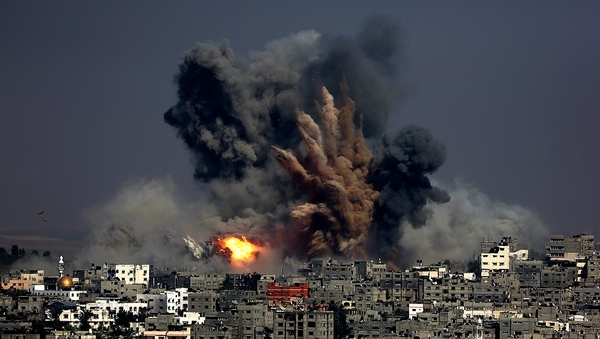 The Palestinian death toll from 23 days of fighting now stands above 1,330. The conflict has cost the lives of 56 Israeli soldiers, all of whom were killed since the ground operation began, as well as two civilians and a Thai agricultural worker who were killed by rocket fire. The marketplace wounded at least 200, emergency services spokesman Ashraf al-Qudra said, when several shells struck the area in Shejaiya neighbourhood, east of Gaza City. The Israeli army said three of its soldiers had been killed in fighting today. Media reports said the soldiers had been killed and another 15 wounded when a wall collapsed on them while they were involved in an operation in Gaza. The army said the soldiers had been killed while trying to destroy a booby-trapped tunnel. The attack was claimed by Hamas's armed wing, the Ezzedine al-Qassam Brigades, which claimed to have killed a group of soldiers during the bombing of a house in Khan Yunis where they were operating. Another 27 soldiers were injured in other areas inside Gaza. Elsewhere, eight people, including five members of the same family in Jebalya, were killed in other strikes, Gazan officials said. Seven other people were killed in Israel tank shelling in Khan Yunis and Deir al-Balah. Jebalya, which has been under Israeli fire for the past 24 hours, is the largest refugee camp in Gaza. 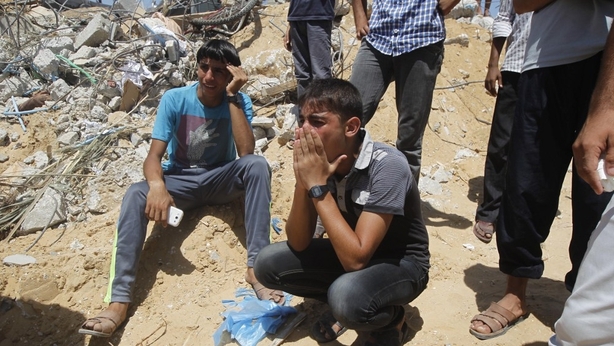 Its population of 120,000 has been swollen by Palestinians trying to escape the fighting. Residents were warned not to return to areas which they had evacuated. Israel launched its offensive in response to rockets fired by Gaza's dominant Hamas Islamists and their allies. UNRWA, the main UN relief agency in Gaza, said it was at "breaking point" with more than 200,000 Palestinians having taken shelter in its schools and buildings following calls by Israel for civilians to evacuate whole neighbourhoods before military operations. We have moved beyond realm of humanitarian action alone. Are now in the realm of accountability and the need for action to end the carnage. The agency acknowledged that it had found a cache of rockets in one school but blamed no particular party. UNRWA spokesman Chris Gunness said the initial assessment was that the school was hit by Israeli artillery. He said the location of the school was given to the Israeli army 17 times. Mr Gunness tweeted: "UNRWA condemns in the strongest possible terms this serious violation of international law by Israeli forces. "Tens of thousands may soon be stranded in the streets of Gaza, without food, water and shelter if attacks on these areas continue. "[The] international community must take deliberate international political action to put an immediate end to the continuing carnage in Gaza." The Israeli assault intensified after the deaths of ten soldiers in Palestinian cross-border attacks on Monday. Israeli Prime Minister Benjamin Netanyahu warned of a long conflict ahead. Diplomatic pressure also mounted, with Chile and Peru saying they were recalling their ambassadors to Israel. Chile, a non-permanent member of the United Nations Security Council, is home to one of the world's largest Palestinian communities outside the Middle East, as well as a sizeable Jewish community. Hamas TV aired footage it said showed the group's fighters using a tunnel to reach an Israeli army watchtower on Monday. They are seen surprising an Israeli sentry, opening fire and storming the watchtower compound to surround a soldier. Mohammed Deif, the leader of Hamas's armed wing, said in a recorded message on television that Palestinians would continue confronting Israel until its blockade on Gaza, which is supported by neighbouring Egypt, was lifted. "The occupying entity will not enjoy security unless our people live in freedom and dignity," Mr Deif said. "There will be no ceasefire before the [Israeli] aggression is stopped and the blockade is lifted. We will not accept interim solutions." Israel has baulked at freeing up Gaza's borders under a de-escalation deal unless Hamas disarmament is also guaranteed. Egypt said yesterday it was revising an unconditional truce proposal that Israel had originally accepted but Hamas rejected, and that the new offer would be presented to a Palestinian delegation. An Israeli official said Israel might send its own envoy to Cairo. The administration of Palestinian President Mahmoud Abbas in the Israeli-occupied West Bank voiced support yesterday for a 24-72 hour ceasefire. It said it was also speaking for Hamas and Islamic Jihad in Gaza. A Tel Aviv University poll published yesterday found 95% of Israel's Jewish majority felt the offensive was justified. Only 4% believed too much force had been used. Both US President Barack Obama and the UN Security Council have called for an immediate ceasefire to allow relief to reach Gaza's 1.8 million Palestinians, followed by negotiations on a more durable end to hostilities. Efforts led by US Secretary of State John Kerry last week failed to achieve a breakthrough. The explosion of violence appeared to dash international hope of turning a brief lull for the Muslim Eid al-Fitr festival into a longer-term ceasefire. 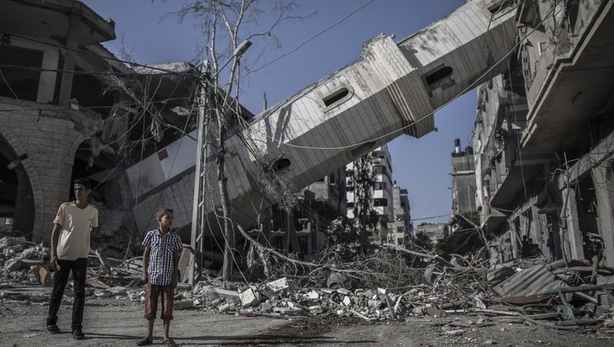 Hamas preaches Israel's destruction, but has been open to long-term ceasefires. Since it is shunned by the US and Israel as a terrorist group, Mr Kerry's mediation has been facilitated by Egypt, Turkey, Qatar and Mr Abbas.